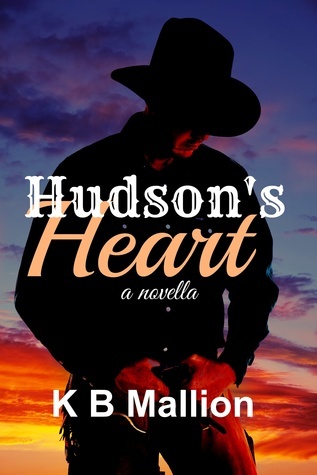 A HOT DUDE +1GAL ON VACATION ON A RANCH =HUDSON’S HEART GOTTA READ THIS ONE!!! OMG This Book is SO HOT THAT YOU HAVE TO READ IT AND THEN JUMP IN AN TAKE A COLD SHOWER!! IT’S JUST THAT GOOD!! I rec’d ARC from this amazing author in exchange for an honest review. This is Mismousey’s very honest opinion of “HUDSONS HEART”. And let me tell you this- boy was I not let down one moment while reading this story. From the very moment I opened up my e-copy of this delicious read – she had me hooked -hook,line and sinker!! It is a fast past read- set in the west on a ranch( now who wouldn’t want to be on one right?) The way in which the author writes is so moving. She captives you with her love story of Dada and Georgia. Finding the right pace setting,tone -environment for these two lovebirds to find themselves in each other. K B Mallion has truly found her way in writing this amazing and Ranch-fantastic story of the year. For an author to write about westerns and cowboys then to add romance to the storyline -instead of murder or mystery. In book is terrific, it is a awesome!! Ms Mallion you have done an outstanding job with the plot of the book-amazing cover design- storyline- your characters jump out at you and off the page. You make them seem so real and life like. I could actually see my self having a conversation with Georgia, Dade-his parents,and Seth.. And let us not forget your scenes my god they are so amazing!! You have written them so vividly that one can actually picture oneself riding horseback at sunset or even taking a skinny dip. That is how well this book has been written an described. As for the storyline itself- you find a young women by the name of Georgia who lives across the pond. She is tried of her life-had a boyfriend -he cheated on her-relationship was going no where-they split – she quit her job and and decided to come to the US of A. Wanted to see a Dude ranch and live a little. Her mother thought she was crazy and like her father free spirited. Georgia comes to the Hudson Ranch to enjoy herself for 2 weeks- horseback riding- cattle round up- ranch life- those sort of things. Never did she think she might find what her soul was missing all along. Now I am not gonna tell you any more- THIS IS A MUST READ!! AND I DO MEAN YOU GOTTA READ THIS HOTTIE OF A BOOK !! IT HAS YOU ON PINS AND NEEDLES !! I recommend this book for all readers- Mismousey gives HUDSON’S HEART a firm 50 out of 5 stars.RIDE ON OVER AN GET YOUR COPY TODAY!!! SO WHAT ARE YOU WAITING FOR ?? GET YOURS TODAY!!! ← PRE-ORDER YOUR COPY NOW OF DUKE’S BEDEVIL BRIDE BOOK 2 IN THE ROYAL PAIN SERIES!! !